As mentioned in my recent post, here are a few pictures of the two commissioned afghans that were such a pleasure to make for the children a friend. 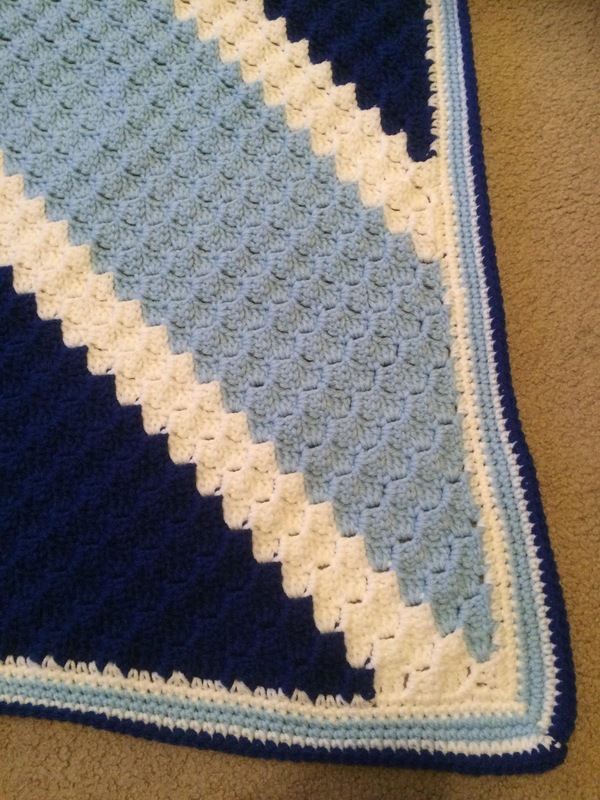 She knew of my love of crocheting and wanted a handmade afghan for each of her children, so she asked me to make one for her daughter in purples and blues and one for her son in blues and white. She allowed me to choose the design and the shades. After trying a few different stitches, discussed HERE, these are the two afghans I delivered just in time for Christmas. This is the boy's afghan, done in white and two shades of blue in a simple corner-to-corner stitch. 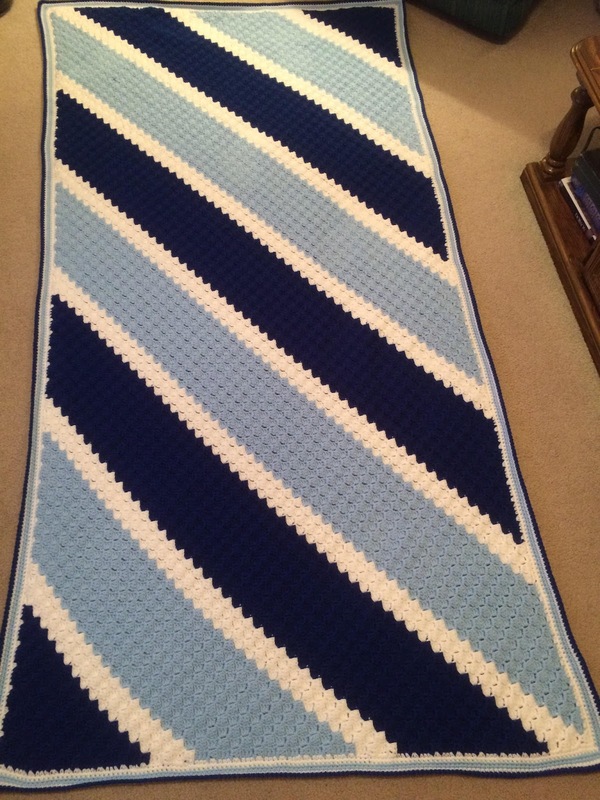 It is the size of the top of a twin bed so this little guy can grow into this afghan and in the blink of an eye, he will be packing it up to bring with him to college! I worked fourteen rows for the blue stripes and four rows for the white stripes. Then I worked a simple border of single crochet around the afghan to give it a little more width. Starting with white, I did a rounds of each color ending in the dark blue. The wide stripes of blues contrasting with the smaller stripes of white give this afghan a manly look that will be perfect for this little boy even when he's all grown up. For the girl's afghan, I really wanted something more delicate and feminine, and it had to look good with three shades of two different colors plus soft white in between. After auditioning a few stitches as shown HERE, I landed on Lucy's ripple stitch from Attic24. If you are a crochet fan but you've never checked out Attic24, you really must! Lucy is always good for some hooky inspiration, lots of awesome color, and fabulous scenic pictures from her beautiful home in England. 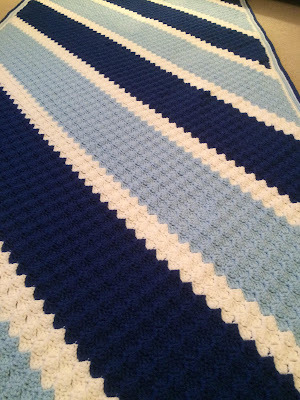 This afghan is also the size of the top of a twin bed. 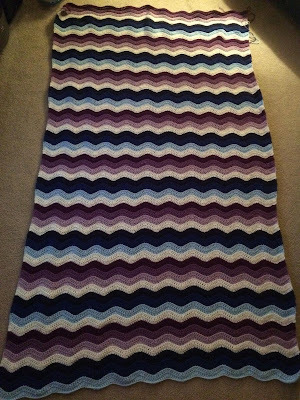 No border was needed for this one so once all the ends were neatly tucked away, it was complete. 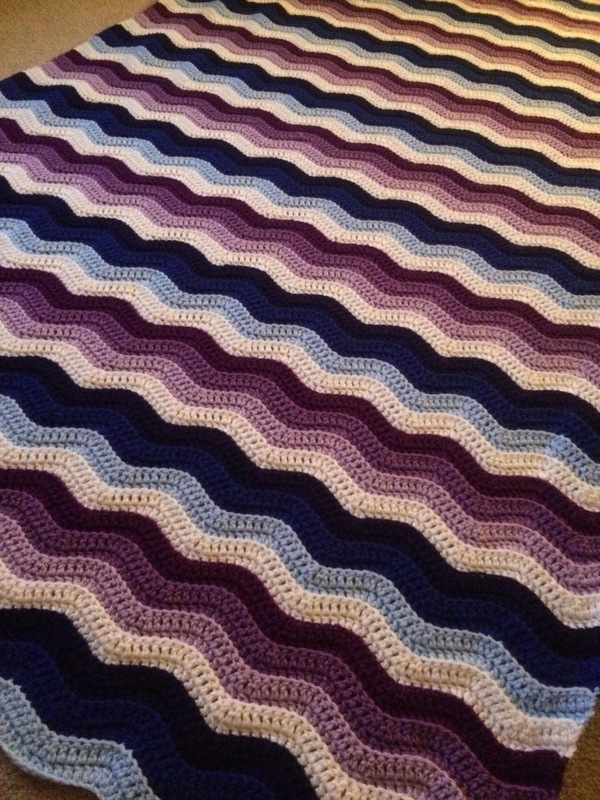 This was my first use of Lucy's ripple pattern and I really loved working it. 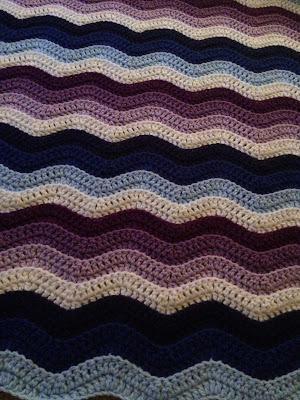 Working the first row of each two-row color section into the back loop gives the afghan a real nice dimension and texture, and adds to the ripple effect. It worked up very quickly too since each row is double crochet. 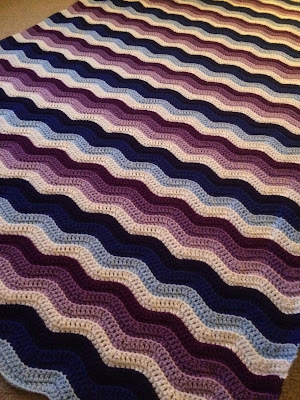 Since finishing these two afghans, I have also finished another even larger afghan using the corner-to-corner stitch. This one will be a wedding gift for a co-worker and I'll post pictures of that one soon. And I've started another project for the same friend who asked for these two afghans pictured in this post. She's keeping me busy! I'll share that one here soon too. What has been keeping your hands busy this winter? I'd love to know! Beautiful work Mary Grace! I have yet to try a corner to corner but must give it a try. I have made several afghans using Lucy's ripple plan and love them - a relaxing crochet! Love the colors you chose for both projects!